General Hospital (GH) spoilers tease that Nathan (Ryan Paevey) will contemplate Dr. Obrecht’s (Kathleen Gati) warning. She’s desperate to make Nathan forget about his father and ignore any buried secrets in the past. Dr. Obrecht believes Nathan should look to the future so he can avoid stirring up trouble. She’s definitely concerned about her son’s mission and what it could lead to. Nevertheless, Dr. O can’t control Nathan’s actions. If she wants to stop or at least muddle the search, she’ll have to get sneaky. Thanks to Maxie (Kirsten Storms), an opportunity could fall right into Dr. Obrecht’s lap. It looks like Maxie will spill info on the DNA test she ordered. Maxie might drop a hint and suggest that they can get answers with or without Dr. O’s cooperation. Of course, Dr. Obrecht may give Maxie the same warning she gave Nathan. She might even rev up the danger angle to scare Maxie out of pursuing this. Once their chat concludes, Dr. Obrecht could easily work her magic and rig the DNA test results. She could use this “proof” to throw Nathan off track. Regardless, it seems Dr. O’s secrecy will finally cause some fears for Maxie. 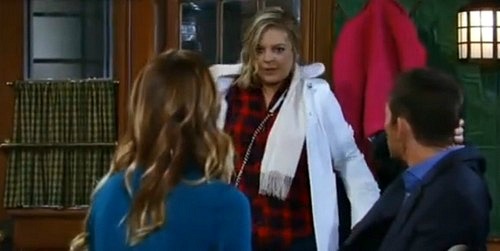 General Hospital spoilers say Maxie will have a terrible nightmare. Will this bad dream foreshadow some future pain? Maxie might imagine Nathan getting hurt or killed because of his quest to find his dad. She could also envision some scary moments for their baby. Maxie will wake up spooked, so this nightmare could alter her plans. She might backtrack and urge Nathan to just work with the info he has. However, Nathan will refuse to give up on learning his father’s identity. He’ll feel like this is necessary to satisfy his own curiosity and ease his mind about the baby’s well-being. GH appears to be giving fans major anvils about a potential health crisis for this baby. Nathan is certainly fretting over what might be coming down the road. Still, Nathan’s the person to be most worried about right now. General Hospital spoilers state that he’s biting off more than he can chew. As Nathan unravels the mystery, he’ll face consequences he wasn’t prepared for. It sounds like this storyline will heat up in the coming weeks. We’ll give you updates as other GH news emerges. Stick with the ABC soap and don’t forget to check CDL often for the latest General Hospital spoilers, updates and news.